Tofu tastes great in chocolate desserts. Chocolate tofu tarts are a great dessert that won't leave you feeling guilty. Tofu is not only cruelty free, but lower in fat as well! Why not indulge your sweet tooth in a heart healthy and environmentally friendly way? Tofu is a very versatile ingredient and can be used in any number of vegan and vegetarian recipes. Most people know that tofu can be used in savory dishes, and often takes the place of meat in fried, roasted, and grilled meals. You might not be aware that it makes a great dessert base as well. Since tofu has a mild flavor and creamy texture when blended, it's perfect for when you don't want to use a dairy cream base. While there are different kinds of tofu available, silken tofu makes the best choice for desserts. It whips up thick and creamy, a texture which is more difficult to achieve with firmer tofu varieties. It's great for adding bulk and creaminess to smooth desserts, and it mixes beautifully with any number of flavorings. When chilled, silken tofu firms up just like a dairy cream filling, and will hold together very well when used in sliced desserts. Try using silken tofu for making vegan puddings, parfaits, popsicles, pies, and tarts. This recipe will please even your most discerning guests, and they'll never guess it's vegan. You can opt to either make one large 8" tart, or eight small ones. In a large bowl, mix ingredients well. Make sure margarine is completely melted, or it will congeal and clump up. For a large tart, spread evenly onto the bottom and sides of a pie tin with the back of a spoon. 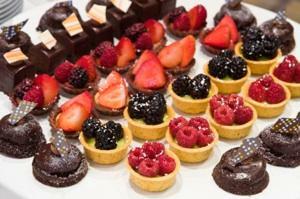 If you are making small tarts, spread into eight small tart forms. Place crust in oven and bake, seven minutes for a large tart, four minutes for smaller tarts. Remove from oven and let cool completely before filling. Do not put it in the fridge to cool down or your crust will get soggy. Drain tofu by placing a paper towel in a colander and then placing tofu on top of the paper towel. Place the colander in a bowl to catch runoff, and let drain for one hour. Blend tofu, sugar, vanilla, cocoa powder, and salt in a blender until very smooth. Pour blended mixture into tart crust(s) and smooth with the back of a spoon. Sprinkle with almond slices for garnish, then place in refrigerator. Chill for at least six hours before serving. If you want to know more about making (and eating!) chocolate tofu tarts, here are some great links that will help you learn more. Vegetarian Times Magazine is chock-full of tofu dessert recipes that will leave you feeling very inspired to cook. The Fat Free Vegan is a perfect site for vegan and vegetarian folks who are concerned about their fat intake. VegWeb has a ton of recipes and information on making vegan desserts. The Post Punk Kitchen, run by Isa Chandra Moskovitz and Terry Hope Romero, sells many great vegan cookbooks and has a forum where you can share recipes.